Did you know that most chemicals used on produce won’t be washed off with a simple rinsing under water? While it would be ideal to only purchase organically grown produce, or to grow your own, that isn’t always an option. This solution is a frugal alternative when 100% organic foods are not available. I still use this solution on the organic foods I buy, as it does a much better job of washing than water alone. The acid in plain white vinegar kills bacteria and helps to dissolve the wax and pesticide residues found on the skins of many fruits and vegetables. As an added bonus, this will help some fruits last longer in addition to making them a healthier option to eat. 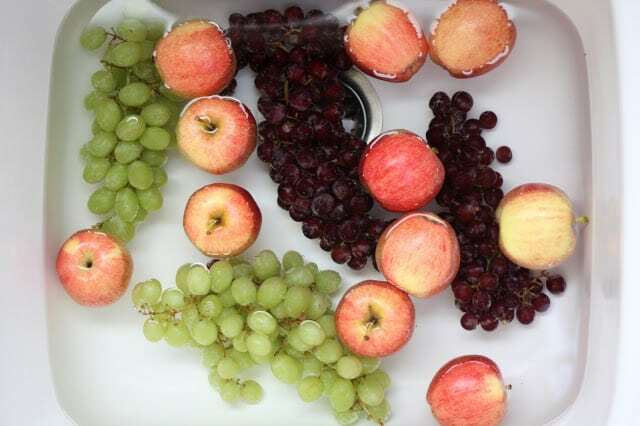 I KNOW that this works, because the water is dirty after the produce has soaked and the apples and grapes have a slight white sheen on them from where the shiny wax had been. Step 1: Make sure your kitchen sink is clean or place a large mixing bowl in the sink. Step 3: Add 1-2 cups of plain white vinegar and soak for 10-15 minutes. I’ve used this method for just about every fruit and vegetable we eat. As long as you rinse well, there isn’t a bit of a vinegary taste on the produce. If some of the fruits bob to the top (like the apples) just swirl them around in the water and rub gently with your fingertips for a few moments. For washing LETTUCES and other GREENS: I only soak greens for a minute or two and then I rinse very well. Be careful to rinse them thoroughly and then spin them or pat them dry. Do not put the lettuces away wet or they won’t last long. I store them in airtight containers lined with paper towels or in ziploc bags with paper towels, with all of the air pressed out. For washing BERRIES (which tend to be more delicate): I place them in a large mixing bowl and then cover with cold water plus 1 cup of vinegar. I swirl them around a bit with my hands (because they tend to float to the top), letting them soak for 5 minutes or so. Drain the water off of them and rinse well. 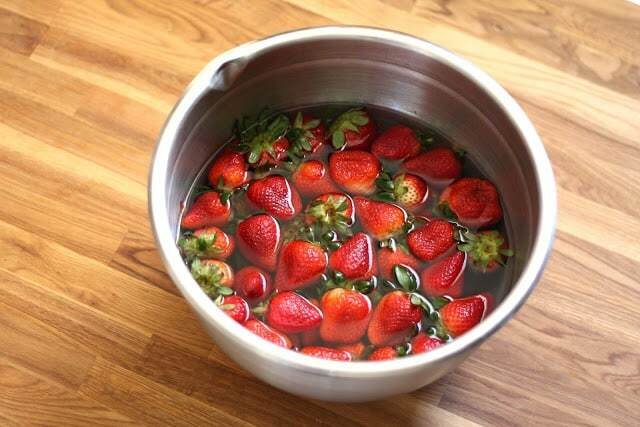 The vinegar and water solution helps destroy bacteria and mold spores, helping the berries last longer. When they are thoroughly rinsed, spread them out on a clean towel or papertowels and gently pat dry. If I am washing raspberries or blackberries, I prefer to let them air dry. I’d rather have them slightly wet going into the refrigerator versus mushed from too much pressure attempting to dry them. (You can also spin them in a salad spinner with a few paper towels.) When they are mostly dry, place them in a paper-towel lined airtight container in the refrigerator. My berries tend to last anywhere from one to two weeks on average. You can also make your own spray solution by combining 3 parts water with one part vinegar. Spray the fruits, let it sit for a few minutes and then rinse well before storing. Very informative post. I have not tried this. I will be trying this now. hi. I first read this post last year I think. I have been using this method of washing fruit and vegetables ever since. It was a bit annoying at the very beginning but I cannot imagine giving it up now. thank you. This is a great way to wash and preserve fruits and veggies. I give all my produce a vinegar and water bath. I add salt to the broccoli, cauliflower, cabbage..... I keep a spray bottle of vinegar and water in the fridge for apples, oranges..... Do you think keeping the vinegar water in the fridge would help or harm the solution? THANK YOU SO VERY MUCH! The HUB came home with 6 packs of strawberries for Mother's Day for me and they are all; soaked with vinegar, rinsed, dried and & in the fridge now using your method. I LOVE, LOVE strawberries and want to make a pie tomorrow. 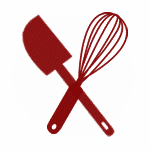 But, first I must make the batter for "Pittsburgh Pancakes" that are out of this world with the strawberries. The recipe can be found at King Arthur Flour if you want the absolute best crispy thin like pancakes in the whole world! But, tonight Abby, our Bichon was allowed to run in the rain and get all dirty with FUN who needs a bath & blow dry after that Anna storm hit her in the Carolinas. I so love life when I can accomplish something after being so sick for the last 11 years. Something has happened, something wonderful, that I cannot explain and I feel like a million dollars today! GOD does answer prayers after all, because I am living proof. Blessed be to all this evening. Thanks Mary! Does the white vinegar have to be Distilled White Vinegar? That's what I have always used. I buy the giant jug of it and it's very inexpensive that way. Excellent tips, THANK YOU MUCH - man, what does vinegar NOT work for? Thank you for this site so far I have really enjoyed it.